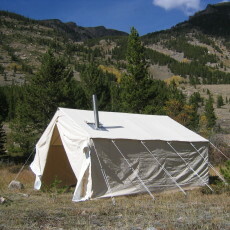 The 10×10 Teton Tent is the perfect choice for spike camps and horse packers. 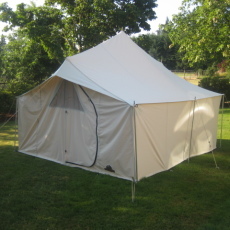 This 4 season tent is made of 10.10oz per square yard marine treated army duck. It is very durable, water repellent, and mildew resistant. A flame retardant version is also available. The roomy 10′ x 10′ floor size allows comfortable sleeping for up to three people. 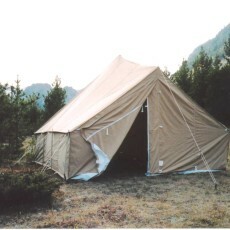 The roof design allows for extra headroom at the front of the tent for easy entry and more standing room inside. 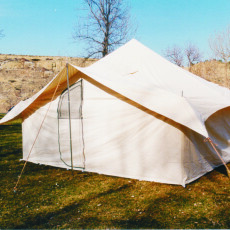 The front and back of the tent is 6’4″ and rises up to 7’11” at the center. The walls are 30″, making the floor space totally usable and the sewn-in floor keeps out cold wind and critters. It is also available with a 4′ side wall.